For music the action most worth watching is also found where the (ragged?) edges meet - on the shorelines where traditions mix, in the weather fronts where styles collide, and at the international boundaries where cultures fuse. Not at the dead - in more ways than one - centre where risk and tension are bleached out in the name of accessibility. At the point of tangency you can see things better, as in the new CD of choral music by the Catalan composer Bernat Vivancos. Born in Barcelona in 1973, Vivancos trained at the world famous Escolania de Montserrat which is one of the oldest choral schools in the world. His studies then took a dramatically different direction at the Paris Conservatoire where his teachers included the avant-gardistes Guy Reibel and Alain Louvier. Oslo was Vivancos' next port of call where he worked with Lasse Thorensen, whose influences range from spectralism, through Harry Partch’s 'just intonation' tonal system to musique concrete and the sonology schhol of electroacoustic music. When I explain that Bernat Vivancos then returned to Catalonia, where he combines the post of professor of composition and orchestration at Escolia Superior de Música de Catalunya (Catalonia's Higher School of Music) with that of music director of Escolia de Montserrat (Montserrat Boys Choir) - the house band for one of the world's great Catholic shrines - you will start to understand what I mean by new music from the point of tangency. 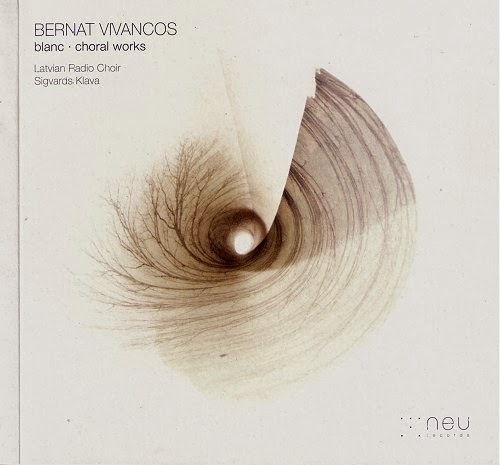 Bernat Vivancos' Blanc - Choral Works is performed by the Latvian Radio Choir, who have a pretty good nose for outstanding new music. With a running time of 86 minutes it comes on two CDs priced at marginally more than a single full priced disc, and offers bonus lossless downloads. It is released on the enterprising and praiseworthy Spanish label Neu Records, which also brought us the CD of music by Ramon Humet that featured in my recent post Britten looking forward. Just as the Southbank Centre's Rest is Noise festival laid to rest the silly convention that new audiences must be young, so Bernat Vivancos' music lays to rest the silly convention that new music must be a difficult listen. Many paths reverberate in Bernat Vivancos' music, most notably the inseparability of the musical and transcendent. Among the sacred works on the disc is a setting of the hymn of praise to the Black Madonna of Montserrat Nigra Sum (I am black) from the Song of Songs (1:5). This text was also set by Pau Casals for Escolia de Montserrat and recorded in 1987 by the Escolia choir directed by Bernat Vivancos' teacher Father Ireneu Segarra; did the 14 year old Vivancos sing on that recording? Another path leads from Vivancos' contemporary setting of the traditional Catalan folk tune El cant dels ocells (Song of the birds) to the lineage that leads from Jordi Savall and Montserrat Figueras back to Pau Casals and the very roots of Catalan culture; yet more evidence of Catalunya, triomfant.. But this is also new music from where edges meet which embraces spectralism, polychorality, modal harmonies and musical calligrams, and explores spatial effects in Messe aux sons des cloches with five strategically placed sets of tubular bells and tam-tams. This new release should meet both Sequenza 21's craving for the recherché and BBC Radio 3's appetite for the non-threatening, and there is even a seasonal link provided by the exquisite A Child is Born - listen here and more samples here. I don't nominate CDs of the year anymore, for the simple reason I believe that any musician who can bring a new release to market through the crocodile infested swamp that is today's classical music industry deserves an accolade. But if I did select CDs of the the year Bernat Vivancos' Blanc - Choral Works would be up for a prize, as would Neu Records in the label of the year category. Also on Facebook and Twitter. No freebies were used in this post. Any copyrighted material is included as "fair use", for the purpose of study, review or critical analysis only, and will be removed at the request of copyright owner(s).